There are no red states or blue states. There are purple states. Mauve states. Violet states. You've probably seen maps that depict America's blended political landscape before ("we are not that divided" writes Jesus Diaz over at Gizmodo), but odds are you've never seen one quite like this. It was created by datavizualization expert John Nelson, and it's one of the most information-rich political election maps we've come across yet. 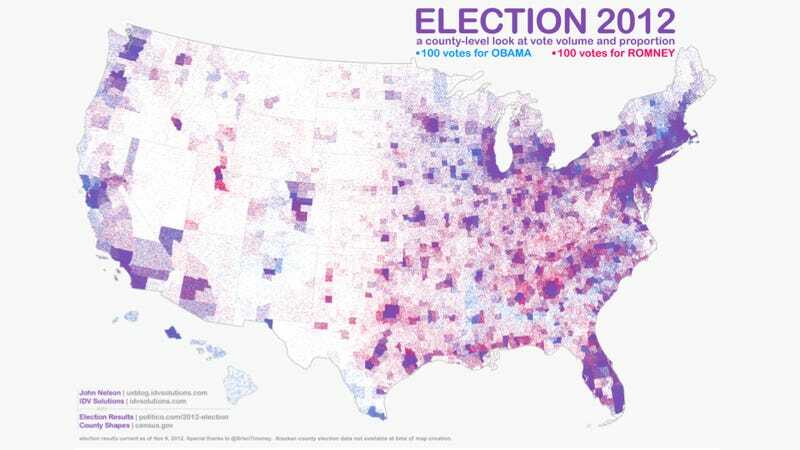 In an email to io9, Nelson describes his map as "a pointillist look at the 2012 election results, which does a fairer job of illustrating where, how many, and how people voted in the election than the more typical full-color generalization." "I was inspired by a style used recently by a previous advisor of mine, Kirk Goldsberry," says Nelson, "who used incredibly dense dot density maps (nothing new about dot density maps) to illustrate the ethnic and political variations in a couple suburban Texas locations." (Those interested in Goldsberry's maps can find links on Nelson's blog.) "This," Nelson says, "in conjunction with seeing so many horrible cartograms and pseudo-extruded county maps, and even vanilla solid-color maps that miss the boat on variations in population density," inspired him to create the map you see here. Like his past visualizations, Nelson's map is based entirely on publicly available data. This particular dataset came from Politico via @GuardianData and @BrianTimoney. Read more about Nelson's latest visualization over on his blog. Check out more of our coverage of his work here.